Welcome to Menu Planning 101! To keep my blood sugar in line (I am a Type 1 Diabetic), I eat a Paleo diet which is fresh, whole foods prepared from scratch in my kitchen. Because of this, I am a firm believer in menu planning. In order to succeed in cooking from scratch at home, you need a plan. 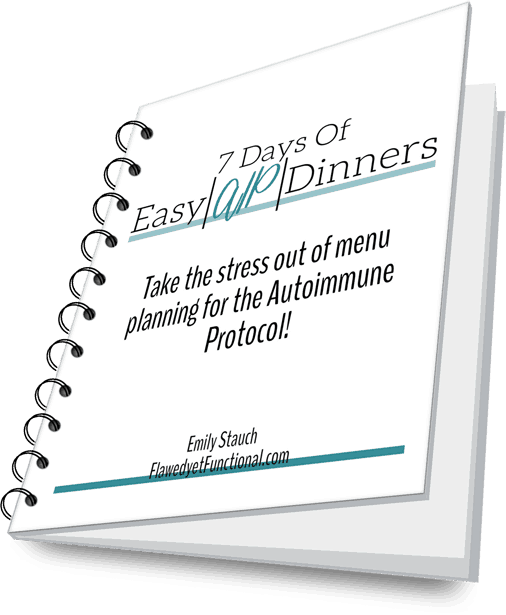 If you are just joining me, check out Part 1, How to Make a Dinners Only Menu Plan, then jump right in to today’s topic: Making the Grocery List! Today I’m going to share how I make my grocery list. It is super simple: a Google Sheet that I have saved to Google Drive. I have tried various apps (Google Keep, Everlist, etc. ), but I keep coming back to a simple spreadsheet for three reasons. Organization – I like my list to be organized from the back of the store to the front of the store. There are grocery list apps that will group items like “produce” or “deli,” but I want to list my items exactly how I walk through the store, not how grocery stores are generally arranged. Sharing – I know most apps allow the user to share lists/notes/etc, but my husband does NOT want another app or program on his phone. He uses Google Drive too, so we share the same grocery list spreadsheet. If I ask him to stop at Meijer on the way home, he knows exactly where to look to see what I want him to pick up. Best part? I can edit it from home! He won’t even know I added 3 items I forgot to mention! Accessible from Any Device – I can pull up my grocery list on my phone, desktop, or husband’s phone seamlessly. Now you know the method to my madness, let’s dive into how the spreadsheet works, creating a route (if you shop at multiple stores), and how to best use the spreadsheet as you go through each store. My workbook is divided into different worksheets for each store. I avoid putting more than one store on each worksheet so I won’t have to scroll left or right which is not ideal on a phone. I have 3 columns on each worksheet: Grocery Item, Quantity, and Cost. Obviously, this is the item you pick up and put in your cart. 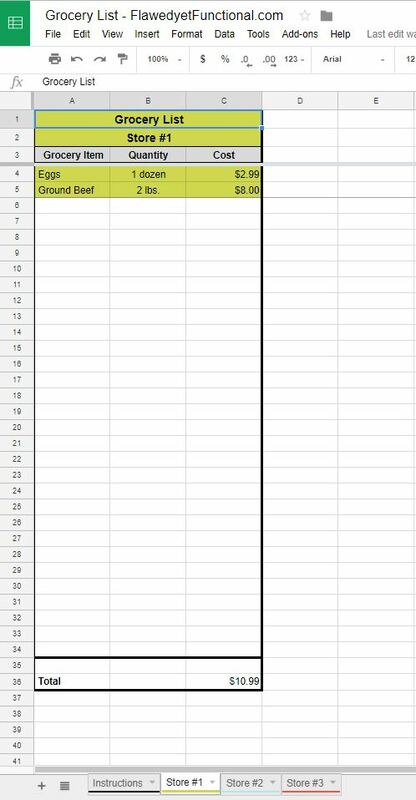 The beauty of a spreadsheet here is you have as much room as you want to describe your item (if you don’t mind scrolling to the right, that is!). How much do you need to buy? Write it here! I’m usually vague and just type a number, but I’ve started being more specific. For example, I needed to buy 9 dried ancho chilis this last shopping trip. They come in packages of 3-4 at my store. I put down a quantity of “3” on my list. When I got to the store, I assumed that meant 3 dried chilis, so I bought 1 package. WRONG! I needed 3 packages of dried ancho chilis. I was kicking myself as I prepared my chicken chili with the only dried chili I had remaining after I made my first recipe. The chili was not so good with only 1 ancho chili! Note to self: be very specific in the quantity section! Even though I made the list, I forget too! I estimate the total cost for each item, given the quantity I am buying, as I make my list. This allows me to keep my grocery budget on track. I’m not always right on the cost, but I’m usually close. Staying on track budget-wise is a topic all of it’s own. I will hit that in another post. For now, get used to estimating what each item costs. After I have all my items, with their quality and cost accounted for, I go back through each list and organize it from the back of the store to the front. I am usually shopping with my two kids, and I want to be as efficient as possible. I’m sure you saw this coming, but not only to I organize each list, I organize my route. I used to drive from closest store to furthest out store. I now hit Aldi first then Meijer then Costco. The distance between the stores is not much, so even though it isn’t furthest away to closest or vice versa, it maximizes my budget. I have my Aldi list for all items I might be able to get from that store because I know they will be the cheapest. If Aldi doesn’t have an item, I put it on my Meijer list while going through Aldi so I don’t forget. Then I stop at Meijer to pick up everything I couldn’t get at Aldi or more outlandish produce items (leeks, kale, etc.). The last stop is Costco because their selection doesn’t change. I buy the same things there week in and week out. Make your shopping route to maximize your interests: total miles driven, budget, or ease of getting to each store. If I am unable to get an item at one store, I add it to my other lists to grab at the other stores. Would you like a copy of the workbook? Download it by clicking here. This link will download an Excel (.xlsx file) file to your Downloads folder (for a PC). If you are like me and don’t have Microsoft Office, simply upload the file to Google Drive to view and edit. I included some basic instructions in the file for those not familiar with using a spreadsheet. If you don’t use a smart phone, the document can be edited on a computer then printed out to bring to the store. If you need more guidance, feel free to ask! All these little details make for a smooth shopping trip which is a great way to start to a week full of nutritious meals. It will take some practice, but after just a few tries making a grocery list, planning your route to and through the stores, and editing your grocery list as you go, it will be second nature. You will shop quicker, forget fewer things, and be ready to cook! What is your method for making a grocery list? Do you have a favorite app? Share any tips you have!